HELLO.....My name is Mike Ward. I am a native Mobilian, a local business owner and an avid outdoorsman. It is my love for the great outdoors that ultimately led me into the real estate business, specifically, land and timber. In 1976, my dad, Fred Ward and I opened Ward''''s Sporting Goods. It has been a successful business and has served Mobile with the best hunting and fishing products for over 30 years. Owning this business gave me the opportunity to meet people who enjoy hunting and fishing as much as I do, like Mike and Sheree Dees. I learned how to be of service to our customers and give them products that would make hunting and fishing enjoyable. It also gave me the opportunity to be associated with organizations like the National Wild Turkey Federation, Coastal Conservation Association, Alabama Wildlife Federation, Southern Kingfish Association, Mobile Big Game Fishing Club, and many others. From 1989 until 1996, I co-hosted a weekly one-hour live television show called the Mobile Sportsman. We traveled around the local area filming hunting and fishing events; aired it on the show, and answered callers'''' questions. Now, every Friday at noon, I co-host a weekly radio show on WNSP 105.5FM, with Wayne Gardner and Sean Sullivan. I really enjoy everything I do and do everything I enjoy with determination and commitment. 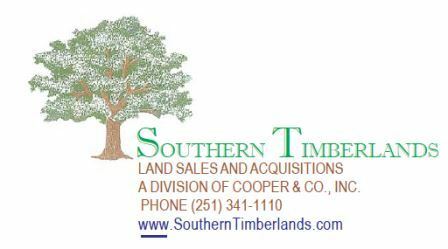 That is why when you do business with SOUTHERN TIMBERLANDS, you''''ll be doing business with people who are dedicated to our profession and, like myself, have that same spirit of commitment and determination to help you obtain that perfect piece of property to suit your family or business plan.